The following section assumes knowledge of general Novell OES Linux system management including using the command-line, creating users, editing configuration files, and understanding file permissions. Before starting the installation, take a few moments to verify you have the system requirements. Is the operating system version supported and are patches up-to-date? (see PaperCut MF System Requirements). PaperCut NG/MF is designed to integrate with iPrintiPrint is a technology developed by Novell that allows users to install printer-drivers from a web browser and to submit print jobs over the Internet or a local network through the standard Internet Printing Protocol (IPP). Common desktop operating systems such as Windows, Linux, and Mac support iPrint. on Novell OES Linux. If your printers are currently hosted on iPrint on a Netware server or even under legacy NDPS, migrate your queues over to an OES Linux based server. Ensure your printing is correctly working under iPrint on OES Linux before continuing to the next step. iPrint and the print queues must be configured and confirmed to work before progressing to step 2. 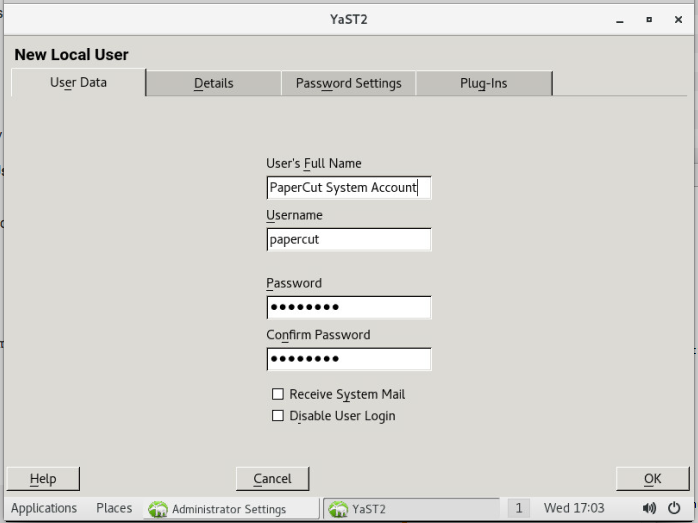 Open YaST Control Panel; then under Security and Users select User and Group Administration. Select Users; then click Add to create a new user. The New Local User screen is displayed. On the User Data tab, enter a username of papercut and assign a password. On the Details tab, select Empty Home with permissions 755 and change the Home Directory path to define an alternate install location. Click OK. 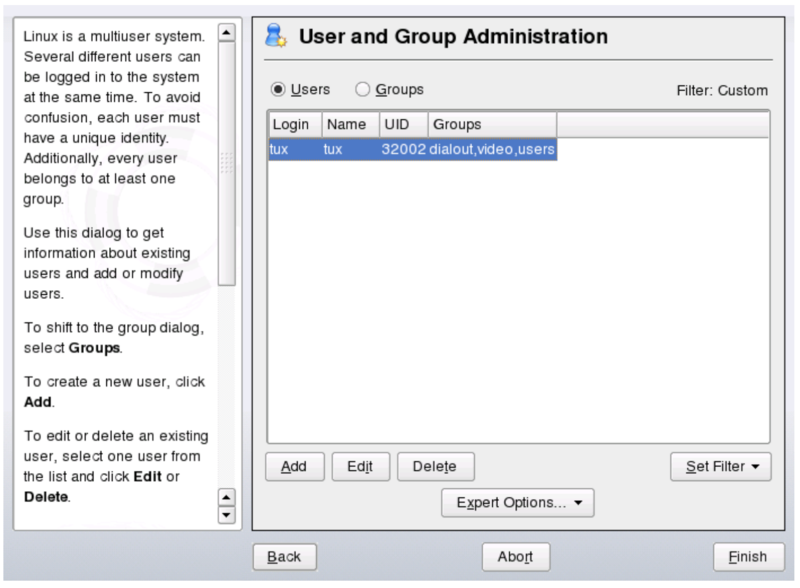 The User and Group Administration screen is displayed. Select Groups; then click Add. The New Local Group screen is displayed. Type the group's name as papercut. In the Group Members list, select the new user you just added. Click OK; then click Accept to create the account. This quick start guide assumes the install location is /home/papercut. If an alternate home location is defined, some of the paths listed in subsequent sections will require modification. Open YaST Control Panel; then select Firewall under Security and Users. Select Allowed Services, then click Advanced. Add ports 9191 and 9192 to the TCP Ports list (separated by spaces). Click OK, Next, then Accept to apply the changes. PaperCut NG/MF is supplied as a self-extracting and self-installing archive. The installation is performed under the rights of the newly created papercut account and temporary root access is required. Make sure the root password is handy. (Administrators who are after a detailed explanation of the install process should also consult the background information in PaperCut NG/MF on Linux). Follow the installation instructions and enter the root password when requested. Ensure you login as the user papercut so that the user's environment is sourced and the home directory (install location) is correctly defined. The installation process takes between two and five minutes depending on the speed of the system. A system restart is not required but administrators are advised to perform installation on live production systems during periods of low activity - for example, not during backup operations or other administration activities. PaperCut NG/MF extracts user information out of the System or Domain. This is usually LDAPThe Lightweight Directory Access Protocol (LDAP) is a directory service protocol that runs on a layer above the TCP/IP stack. It provides a mechanism used to connect to, search, and modify Internet directories. The LDAP directory service is based on a client-server model. or Google Cloud Directory. The options presented here vary depending on the Operating System and its environment. During evaluation, most sites import all users from the system/domain into PaperCut NG/MF. An option also exists to import a subset of users from a given group. This option is useful when only a subset of users will use the printers. PaperCut NG/MF has native support for eDirectory LDAP schemas. This is the default user import option for most sites. 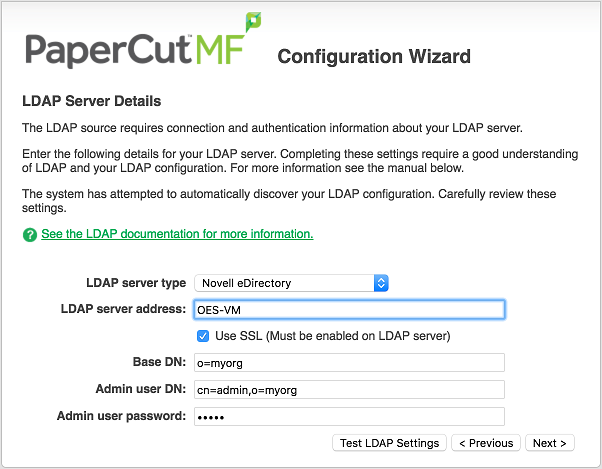 PaperCut NG/MF does its best to auto-discover LDAP settings, but some knowledge of eDirectory and/or LDAP is required. More information on LDAP is available in Synchronize user and group details with LDAP. You also have the option to use Google Cloud Directory as the sync source. To set up Google Cloud Directory as the sync source, follow these instructions. However, in environments where user interaction for Account Selection is required and can only be done via the User Client (and cannot be done at the printing device), running the User Client is mandatory. Hence, deploying it immediately is also mandatory. If not, the user is unable to carry out the configured user interaction for Account Selection, and the job remains paused in the print queueA print queue displays information about documents that are waiting to be printed, such as the printing status, document owner, and number of pages to print. You can use the print queue to view, pause, resume, restart, and cancel print jobs. and does not appear on the printing device. Log in to iManager, expand iPrint; then select Manage Printer Manager. 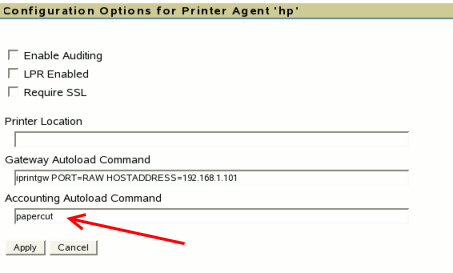 Select the Printer Manager associated with one of your print queues. 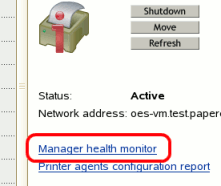 Click the Manage health monitor link. A list of all your printers is displayed. Select a Printer Agent from the list. Enter papercut under the Accounting Autoload Command. Take care to write this all in lower case with no spaces. In iManager open up the active Print Manager. Finally restart the Printer Manager in iManager by clicking Shutdown then Startup. After this, all jobs on the queues are tracked. This software needs to be shared over the network so workstations can access/install the client application. Novell iManager provides a number of file sharing options. One simple solution is to add a read-only NCP or SambaSamba is a Windows interoperability suite of programs for Linux and Unix. It is used to integrate Linux/Unix servers and desktops into Active Directory environments. It can function as both a domain controller or as a regular domain member. share called PCClient pointing to /home/papercut/client. Established networks will benefit from ensuring the client files are available in their Distributed Files Services. The deployment of the client software (e.g. zero-install deployment) is covered in User Client. In environments where user interaction for Account Selection is required and the user has both these options (User Client and printing device), running the User Client may be optional. Hence, deploying it immediately is also optional. If you choose not to deploy it now, you can still deploy it in the future. However, in environments where user interaction for Account Selection is required and can only be done via the User Client (and cannot be done at the printing device), running the User Client is mandatory. Hence, deploying it immediately is also mandatory. If not, the user is unable to carry out the configured user interaction for Account Selection, and the job remains paused in the print queue and does not appear on the printing device. The User Client can be deployed directly from a network share (which is automatically configured on Windows). There is also the option to install the software locally on each workstation, however, this is not usually recommended because it makes the process of updating the User Client more complicated. For more information about the Account Selection options with and without user interaction (via the User Client or printing device), see Shared accounts, User Client, and Assigning accounts to print jobs at the MFD. 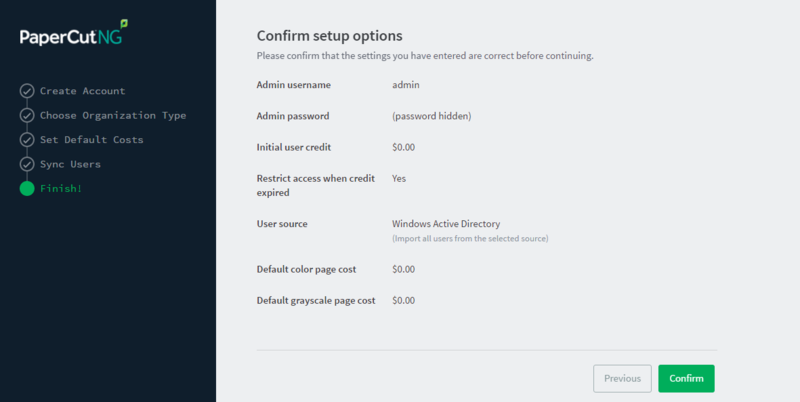 After deploying the User Client on user workstations (if required), you can configure users with the required Account Selection option (whether or not user interaction is required). For example, in a Professional (Client Billing) installation, users who print jobs for clients are often given the Advanced Account Selection option, however, other Account Selection options might be better suited for some users based on their job function. You can configure the required Account Selection option on one user at a time or update for all users in bulk. 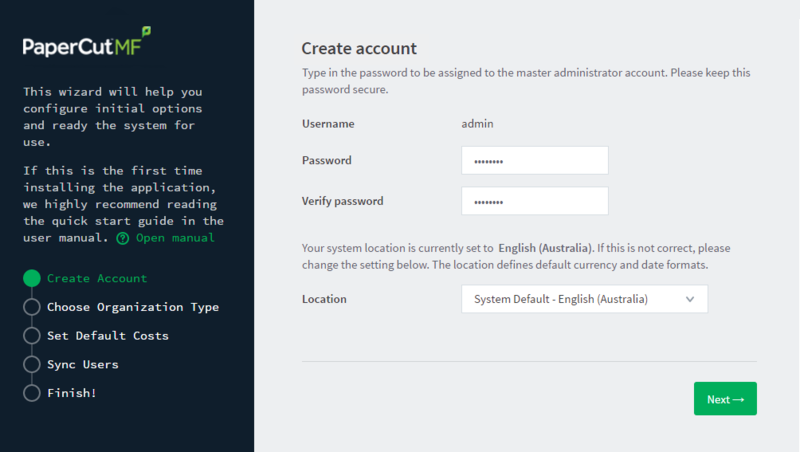 Use the User Details page to configure the required Account Selection option for a single user. The User List page is displayed. In the Actions menu, click Bulk user actions. The Bulk User Operations page is displayed. By default the action is applied to all users (the special [All Users] group). To apply the action to a subset of users (a user group), select that group from the list. In the Change settings area, select the Change account selection setting check box; then select Show advanced account selection from the list. If you do not want to allow users to charge printing to their personal account (i.e. they must select a shared accountA shared account is an account that is shared by multiple users. For example, in business, shared accounts can be used to track printing costs by business unit, project, or client. Organizations like legal firms, engineering firms, or accounting offices often have long lists of accounts, projects, clients, or matters. In a school or university, shared accounts can be used to track printing by departments, classes, or subjects.) then clear the Allow user to charge to their personal account check box. A confirmation window is displayed. Once completed, the configured Account Selection option is enabled for the selected users. If you have configured users with an Account Selection option that requires user interaction, then it is recommended that you test this from the User Client on a desktop or on the printing device (if applicable). Ensure that user interaction provided is as per the configured Account Selection option. Once the interaction is completed, ensure that the job is printed, logged and appropriate account charged.